The gender gap in the professional world is closing, albeit slowly. Women now make up 48% of the general workforce. But the tech industry, for all its claims of being revolutionary, is still lagging behind. And while the data science industry is slightly more balanced than the broader tech industry, it is still a part of this problem. Only about 30% of professional data-related roles are held by women as of 2019. Moreover, that’s just the gap in general employment. There’s an even more significant gender gap in tech and data science leadership roles and in technical roles. 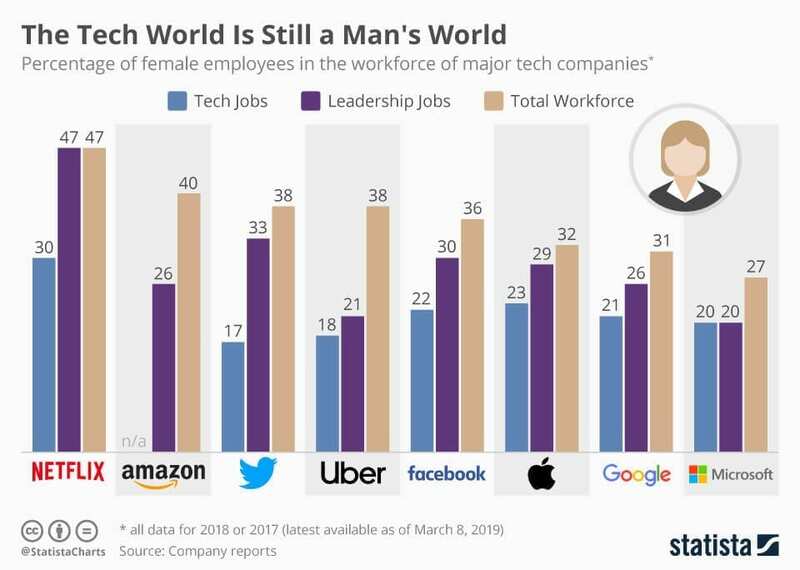 For example, despite the fact that the number of technical and data-related jobs has skyrocketed in the last couple of decades, even at the biggest tech companies women aren’t getting anything close to equal representation. What are the causes of this problem? And more importantly, what can people working in the data science industry do to solve it? One of the biggest reasons we see fewer women in leadership roles is the lack of paid leave for both genders. Historically, women have been seen as the primary caretakers for children and elderly relatives. Over the past century, more women have become educated and decided to enter the workforce. But when families have a child or when elderly relatives become ill, it is still often the woman who sacrifices her career to serve as a caregiver. There are cultural reasons for this imbalance, but there are also financial ones. Childcare and elderly care are expensive, and paying for full-time professional care is out of financial reach for most families. Most companies don’t offer benefits like paid parental leave to men, and with the gender pay gap (which we’ll talk about shortly), women often make less money than men anyway, so it has made more financial sense for many families for women to be the ones who stay home. In order to make changes in this dynamic, we have to shift the mindset that men cannot be caregivers. Companies need to do a better job of offering paid leave to both men and women. We also need to make it easier for women to tell their companies that they will be expecting a child. Many women fear the “Motherhood Penalty”, the idea that management will see their motherhood as evidence that they’re less focused on their career, and shut them out of advancement opportunities. Companies should offer mandatory paid leave for men (whether for paternity or elderly care reasons), and men who have the optional paid leave benefits available should make use of them. Having more men taking parental or elder-care leave will help to chip away at the biased perceptions that underpin the “Motherhood Penalty” mindset. Large companies like AT&T, PriceWaterhouseCoopers, and Home Depot have already seen the benefits of adding or expanding their paid leave policies. Chief among these benefits: offering paid leave policies can help with talent retention. Expanding "maternity leave" to "parental leave" isn't just a win for diversity and inclusion, it's often a financial win for the company as well. The gender pay gap is a real and scary thing. White women still only make about 80 cents for every dollar a white male makes, the statistics are even more dismal for women of color. This gap has a variety of causes. A big one is that it’s self-perpetuating. When employers ask new hires about their previous salary, if a woman has been underpaid and if she answers honestly, her new employer is likely to offer less than she deserves, too. For this reason, some US states have made or are working to make asking questions about previous salary illegal, which would prevent companies from being influenced by a woman’s past salary when coming up with her new offer. Even in states where this is not mandatory, though, data science employers should make it company policy not ask candidates about previous salaries. Offers should be based on job responsibilities and the candidate’s skill set. Not asking about previous salaries will help end this self-feeding cycle of women continuing to be paid less than men because they’ve been paid less in the past. Another reason women are still getting paid less than their male counterparts is that women are less likely to ask for raises or negotiate salary offers. This has to do with external social pressures; women are sometimes seen by management as greedy or overly aggressive if they talk about money or push for a better paycheck, whereas men doing the same thing may be seen as ambitious. Women are also sometimes hesitant to ask for raises and promotions because they fear they’d be seen as asking for too much if they’ve already taken (or later plan to take) maternity leave or some other kind of paid leave. For this to change, men in data science (particularly those in leadership roles) should encourage women to negotiate their salaries, and should fight against the biased perception that it’s “greedy” or “aggressive” for a woman to ask to be paid what her skills are worth. Companies making parental leave mandatory for both genders and men taking paternity leave when the option is available to them will also help address this problem. Another cause of the gender pay gap is that money is frequently a taboo subject in the workplace. While women are generally aware that the gender pay gap exists, they often don’t know how their salary compares to their peers. Employees in the US rarely discuss their salaries with each other (and in some cases, sharing salary numbers is actively discouraged by management, although it is generally illegal for companies to forbid employees from talking about their salaries with each other). Men in data science can help with this by proactively sharing their salaries with women who work in similar positions to them. Women should also check online sources like Glassdoor regularly to keep tabs on the market value of their skill set, and any company salaries that have been shared by employees. It’s possible to search for salaries by title and location, and checking the local average (and specific salary reports) frequently will give women in the industry a better idea of what their skills are worth, and whether they’re being underpaid. (We have some helpful tips on salary negotiation in our career guide for anyone who finds themselves in this position). A big reason women for the gender gap in data science is that from an early age, many women are discouraged from pursuing a career in STEM. There are many factors in play here, including a lack of exposure to positive female role models in STEM, the social norms that often push women away from STEM jobs, and a difference in treatment that can start almost from birth. For example, it is common for a young male child to receive toys like Legos, dinosaurs, science sets. Often these types of toys and books are explicitly labeled for and marketed towards boys. Rather than letting young girls follow their own natural curiosities, the messages they receive from marketing, from gifts, and often from school and family life push them towards “traditional” gender roles, and don't encourage an interest in STEM. This isn’t a problem that data science industry can address directly, but data scientists with children should make an effort to expose children of both genders to STEM-related toys and activities from early childhood, and make it clear that it’s okay for them to pursue anything they’re interested in, regardless of whether that thing is traditionally associated with one gender or the other. Providing positive role models for young girls is extremely important too. Although history is full of examples of inspiring women working in STEM, in our culture these stories aren’t told as frequently as stories about male tech leaders and role models. We need to teach our daughters and sons about women like Jean E. Sammet, Grace Hopper, and the group of African American women who were essentially “human computers” at NASA in the 1940s. These women are not praised enough for the work they’ve done in the history of the tech world, and it's important for kids to learn that it's cool to be intelligent and informed, no matter your gender. These sorts of societal roadblocks continue into adolescence and early adulthood, too. It’s hard to watch TV, read a magazine, or wander through social media without seeing some depictions of what a woman should look like, or how a woman should behave. Often, these depictions reinforce traditional gender roles and stereotypes. Intelligent, powerful women are also depicted as being lonely, aggressive, greedy, less attractive, etc. Again, data scientists can’t address this directly, but we can all help to fight against it by sharing and supporting TV shows, films, and books that present women in STEM and women in leadership roles more positively. There are other things we can do to make the data science industry more accessible to women. Building communities and resources for young girls and women in STEM creates an increase in women in the tech field, and encourages more girls to pursue technical degrees. Programs such as Girl Develop It, TechGirlz, Within, Girls Who Code, R Ladies and PyLadies, #YesWeCode, Black Girls Code, and Women in Technology are all focused on providing support and knowledge to women all over the world, and they’re making a significant impact. Making STEM skills easier for anyone to access is also important. Dataquest is one of many online education platforms that puts data science skills at the fingertips of anyone with an internet connection. These platforms require far less time and far less money than a traditional degree, and they allow students to learn data science skills on their own terms. 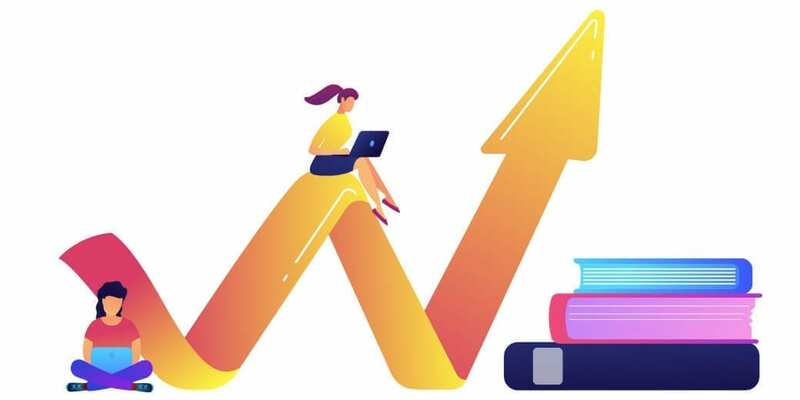 Online education is already making data science skills available to a much broader population of women than could previously access them, and that trend looks likely to continue into the future. Having male allies in STEM can also be a tremendous help. In addition to what’s already been mentioned, male allies can do even more to support their female counterparts in the STEM world, including: supporting and amplifying women, finding women to speak at conferences (and not participating in all-male discussion panels), recruiting women candidates for jobs, and more. If you’re part of a company’s leadership team, you have a particularly great opportunity to make a difference in closing the gender gap. You should pay your male and female employees equally in accordance with their skills, of course, and you should make an effort to recruit and encourage women in STEM. You should bring in speakers and programs like Compassionate Coding that are focused on empathy and diversity to educate both leaders and employees preemptively, before any problems arise. You should create leadership roles like Chief Officer of Diversity and Inclusion that can help ensure all of your employees feel welcome, and feel as if they have a voice. And you should evaluate your company’s sexual harassment policies to ensure that there is no victim shaming, and that perpetrators are punished appropriately. As a minority woman in the technical field, and mother to a daughter myself, I hope that one day in the near future there will be no need for articles like this one. With the help of male allies, companies that genuinely promote diversity and inclusion, and stronger female role models in data science and STEM, I am excited to see the progress that the data science industry and the broader tech community can make in the coming years.